One of the hardest group's histories to compile, New Trolls' story is full of line-up changes, band name changes, struggles between band members... and great hits! In their long story New Trolls have been one of the most popular bands in Italy, and they crossed many different styles, passing through beat, slight psychedelia, progressive, hard rock and melodic pop. The story begins in Genova around mid 60's, when the five musicians, considered among the best in town, decided to form a band, the name coming from the old band of one of them, the Trolls. After some dates as support band for the Rolling Stones, they released their debut single Sensazioni in 1967, the first of a very long series of singles. The band was one of the best live acts in Italy at the time, and Hendrix-inspired guitarist Nico Di Palo was one of the first italian guitar heroes. First album, Senza orario senza bandiera, came in 1968, with lyrics written for them by singer-songwriter Fabrizio De André, a good album, very successful at the time, but still tied to the beat sound of the early days. A second album, simply called New Trolls, followed two years later, in 1970, being a compilation of tracks from their singles. These were still the days in Italy where people preferred the singles to the less popular LP's, and these often were simple compilations of already known songs. At the end of 1970 the first line-up change, with original member Mauro Chiarugi leaving the band, that continued as a quartet. In the same year the band was also involved along with The Trip in the film Terzo canale - Avventura a Montecarlo, and a single from the soundtrack, the beautiful (and sadly unreleased on LP) Autostrada, was their only release on RCA. 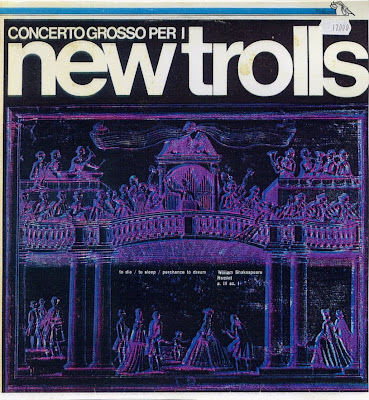 In 1971 their greatest album, Concerto Grosso per i New Trolls, with music written by composer Luis Enriquez Bacalov with orchestral arrangements, an ambitious work that's still recognised as one of the most important italian rock releases ever made. $CUT$In 1972 a new bass player, the italo-canadian Frank Laugelli entered the band replacing Giorgio D'Adamo. With the new line-up the band released Searching for a land, another ambitious work. A double album, with a live side and mostly sung in english, this was a disjointed album and not a great success, as most of the english-sung albums by italian prog artists. Later that year another album, Ut, with a heavier sound, closer to hard rock. A nice album to many, this caused the band to break in two parts, with the two leaders Di Palo and De Scalzi going in two different ways. A legal struggle followed, for the use of the famous name, and while Di Palo with the other three chose the Ibis way, in a hard rock direction, Vittorio De Scalzi formed a new band, called N.T.Atomic System to avoid contractual problems, and with a more polished sound. To help their fans to recognize this band as the real New Trolls, early copies of the album had a sticker on the sleeve covering the N.T. name with the full New Trolls brand. N.T.Atomic System released their first album in 1973, a nice album with a large use of horn instruments, De Scalzi himself playing flute and keyboards along with guitar. A jazz influence can be heard, and it became stronger in their second album, Tempi dispari, a totally instrumental album recorded live in a jazz-rock vein, very far from the New Trolls sound. Incidentally, the group's name on this album is again New Trolls and no musicians are mentioned, but this is in fact the same De Scalzi-led line-up as the previous album. Tempi dispari was rather disappointing and unsuccessful, its two side-long tracks being more in an english jazz-rock style than in the usual mix of hard and melodic prog that New Trolls fans were expecting. A good single was also released by the same line-up, with the band rendition of Mussorgsky's A night on bare mountain (Una notte sul Monte Calvo), and it was also included on their first album reissue with the same name. N.T.Atomic System disbanded after the second album, with Rosset moving to England with Nova and De Piscopo starting a long career as talented session drummer and solo artist. Incredibly, De Scalzi rejoined old friend/enemy Di Palo and drummer Belleno for a new chapter in New Trolls story. Bassist Laugelli also returned from Ibis, and a fifth member was found in former Nuova Idea singer and guitarist Ricky Belloni, giving even more strength to the always incredible multivocal parts of the group. This band released Concerto grosso n°2, an ideal prosecution to their best work, but it was a pale attempt to reproduce that masterpiece. Some parts are good, but the shorter tracks are in a melodic pop vein, and the album is far from their best efforts. Magma label (founded by Vittorio De Scalzi) also released a live album, as the band has always been well known as one of the best live groups in Italy. 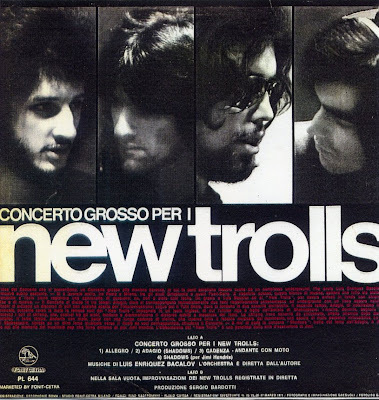 New Trolls live, also in 1976, is a good album, even containing some excerpt from Concerto grosso n°2. In 1978 another new recruit, also from Nuova Idea, was keyboardist Giorgio Usai, but the band slowly abandoned the rock track to a mainstream pop that gave them many more hits (Quella carezza della sera and Aldebaran among them). The band kept playing and releasing mediocre pop albums until early 90's, then came to a new split. Two interesting new CD's have been released in 2001 credited to Vittorio De Scalzi - La storia dei New Trolls; both recorded live, the first one, La storia dei New Trolls (Saar CD 22228), includes reworkings of old tracks, the other, Concerto grosso live (La Stampa CDV 2001), is a very good rendition of Concerto grosso n.1 and 2 with an orchestra. This band still has an intense live activity in 2002 with a very good line-up of De Scalzi and Vitanza with Andrea Maddalone and Mauro Sposito (guitars) and bassist/singer Roberto Tiranti. They're usually playing a mix of 60's through 90's songs, but in some larger theatres they concentrate on the full orchestral version of the two Concerto Grosso's and a more prog oriented tracklisting, catch'em live if you can!! Other past members, led by Nico Di Palo and also including Usai and Belloni, now use the name Il mito dei New Trolls, but haven't yet released anything. It would be wonderful to see this group of great musicians playing together once again!